Annual Carnival is one of the most important events in the Caribbean. Although its date originally depended on the date of Easter, today various countries and territories may celebrate Caribbean Carnival on different dates. For example, Sint Maarten Carnival usually takes place in late April and early May. Sint Maarten is a constituent country of the Kingdom of the Netherlands which occupies the southern part of the island of Saint Martin. The northern part is occupied by the French overseas collectivity of Saint Martin. The French side of the island celebrates Caribbean Carnival in February or March, before Lent, while the Dutch side holds festivities in late April and early May. Before there was Carnival, the government of Sint Maarten had organized Saint Martin’s Day Parade on November 11 each year to commemorate the date when Christopher Columbus discovered the island. However, the French side of the island had its own Saint Martin’s Day Parade that overshadowed the festivities in Sint Maarten. To avoid competition, Sint Maarten’s parade committee decided to move the event to spring. Instead of Saint Martin’s Day, the parade was now dedicated to Queen’s Day (Koniginnedag), a public holiday in the Kingdom of the Netherlands and its constituent countries celebrated on April 30. The date was chosen for many reasons, including that it marked the end of the tourist season in the Caribbean. April 30 ceased to be a public holiday in the Netherlands in 2014, when Queen Beatrix abdicated in favor of her son Willem-Alexander, and the holiday was renamed King’s Day and moved to the king’s actual birthday, April 27. However, Sint Maarten still holds the Grand Carnival Parade on April 30, and this day is a public holiday alongside King’s Day. The Carnival itself usually lasts for about two weeks. It has been managed by the St. Maarten Carnival Development Foundation since 1990. 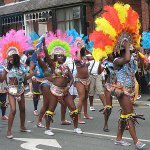 Carnival activities usually include, but are not limited to, parades, street parties, sporting events, pageants, musical concerts, shows, contests, and special events for children and youth. Along with the Grand Carnival Parade, the most important events include the official opening of the Carnival Village, J’ouvert (a large street party that kicks off the Carnival), Labor Day Parade on May 1, and the burning of the King Momo effigy on the closing night. Most of the events and activities during the Carnival take place in the Carnival Village located in Philipsburg, the main town and capital of Sint Maarten. The Village is an open, semi-circular structure that consists of connected booths with food and entertainment. Here people can dance to the rhythms of soca and calypso, sample delicious Caribbean specialties, buy merchandise and authentic souvenirs, and simply have fun. By the way, Sint Maarten isn’t the only country in the Caribbean to have a public holiday celebrated during the Carnival season. For example, Anguilla, Antigua and Barbuda, Barbados, the British Virgin Islands, Dominica, Montserrat, Saint Kitts and Nevis, Turks and Caicos, Guyana, Grenada and the Bahamas celebrate August Monday, also known as Emancipation Day, during their respective Carnivals.